Non-Hodgkin's lymphoma is cancer of the lymphoid tissue, which includes the lymph nodes, spleen, and other organs of the immune system. White blood cells called lymphocytes are found in lymph tissues. They help prevent infections. Most lymphomas start in a type of white blood cells called B lymphocytes, or B cells. For most patients, the cause of this cancer is unknown. However, lymphomas may develop in people with weakened immune systems. For example, the risk of lymphoma increases after an organ transplant or in people with HIV infection. 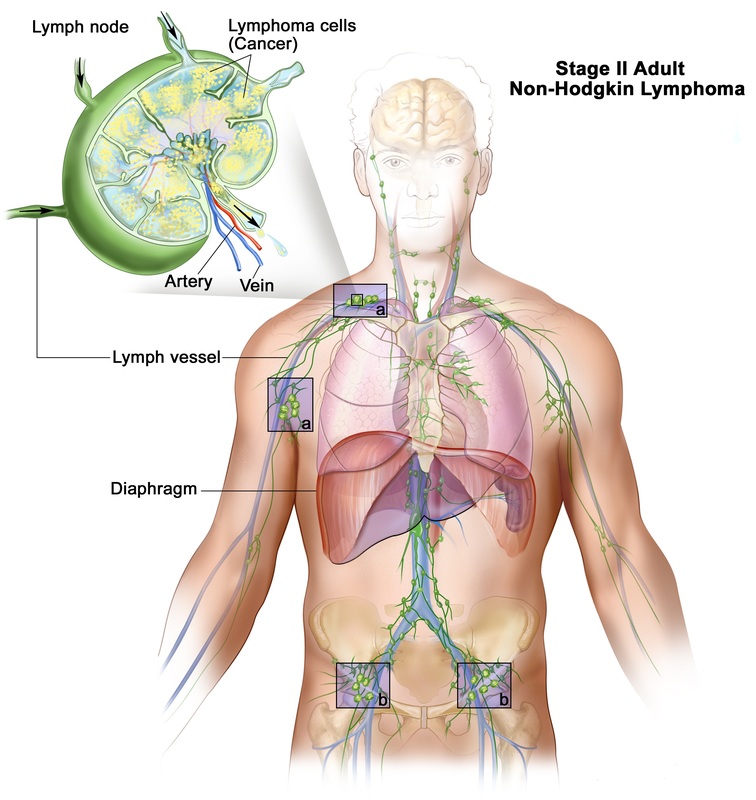 There are many different types of non-Hodgkin's lymphoma. It is classified according to how fast the cancer spreads. The cancer is further sub-classified by how the cells look under the microscope, for example, if there are certain proteins or genetic markers present. According to the American Cancer Society, a person has a 1 in 50 chance of developing non-Hodgkin's lymphoma. Most of the time, this cancer affects adults. However, children can get some forms of lymphoma. High-risk groups include those who have received an organ transplant or who have a weakened immune system. This type of cancer is slightly more common in men than in women. Non-Hodgkin's lymphoma can cause a variety of symptoms. Symptoms depend on what area of the body is affected by the cancer and how fast the cancer is growing. Coughing or shortness of breath may occur if the cancer affects the thymus gland or lymph nodes in the chest, which may put pressure on the windpipe (trachea) or other airways. Some patients may have abdominal pain or swelling, which may lead to a loss of appetite, constipation, nausea, and vomiting. If the cancer affects cells in the brain, the person may have a headache, concentration problems, personality changes, or seizures. The doctor will perform a physical exam and check body areas with lymph nodes to feel if they are swollen. If tests reveal you do cancer, additional tests will be done to see if it has spread. This is called staging. Staging helps guide future treatment and follow-up and gives you some idea of what to expect in the future. Radiation therapy may be used for disease that is confined to one body area. Chemotherapy is the main type of treatment. Most often,multiple different drugs are used in combination together. Another drug, called rituximab (Rituxan), is often used to treat B-cell non-Hodgkin's lymphoma. Radioimmunotherapy may be used in some cases. This involves linking a radioactive substance to an antibody that targets the cancerous cells and injecting the substance into the body. People with lymphoma that returns after treatment or does not respond to treatment may receive high-dose chemotherapy followed by an autologous bone marrow transplant (using stem cells from yourself). Bierman PJ, Harris N, Armitage JO. Non-Hodgkin’s lymphoma. In: Goldman L, Ausiello D, eds. Cecil Textbook of Medicine. 23rd ed. Philadelphia, Pa: Saunders Elsevier; 2007: Chap 196. Wilson WH, Armitage JO. Non-Hodgkin’s Lymphoma. In: Abeloff MD, Armitage JO, Niederhuber JE, Kastan MB, McKenna WG, eds. Abeloff’s Clinical Oncology. 4th ed. Philadelphia, Pa: Elsevier Churchill Livingstone; 2008:Chap 112.